If you're installing vinyl floor tiles in your home or if they're already put down and you're finding that they won't stick, you should consider how they were installed and proceed accordingly. In most instances, the glue on the back of peel-and-stick flooring is very strong. However, you might find that the passage of time or an incorrect installation approach has caused the tiles to begin to separate from the floor. If this is the case, there are some simple steps you can take to fix the issues. If you have stick on tiles in your home that are beginning to separate from the floor, it could be a result of a faulty installation. In particular, the corners of vinyl tile pieces may poke up from the floor and fail to stick. If this proves to be the case, you can use a couple of different repair techniques. You may be able to find a transfer tape, which is extremely sticky, at your local home improvement store. This tape is so thin that it is essentially a liquid adhesive painted on to a paper backing. You can stick the tape onto the floor, then peel back the paper. Press firmly on the vinyl tile so that it adheres to the transfer tape. This should hold down a corner or side that won't properly adhere. Another option is to use Loctite all-purpose adhesive, which is also sold in most home improvement or hardware stores. This is recommended only if you have a few stubborn spots where vinyl floor tiles won't stick, rather than for use underneath the majority of your tiles. (Don't use it for installation, for instance.) If you need to fix a few areas that are giving you trouble, you can use a few dabs of Loctite to keep corners or sides adhered to the floor. 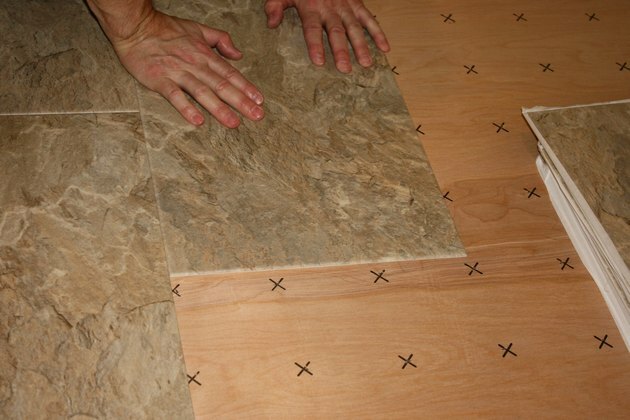 If you are installing vinyl floor tiles yourself, there are some techniques that can help you to avoid issues of adhesion. First of all, be sure that the floor underneath the tiles is clean and free of dust, dirt or debris. Any of these particles can cause issues with tiles sticking. Floors should be clean and dry before you begin to lay down your stick on tiles. There is a product called a vinyl adhesive that can be applied to the floor before you actually lay down the tiles. Though this isn't always necessary, it may help the tiles to stick. A good strategy is to lay a few tiles according to manufacturer instructions and see if they are adhering properly. If not, you may wish to use the additional vinyl adhesive. Apply it to the bare floor everywhere you plan to install tiles, and then lay down your vinyl. It should provide a much stronger bond. Something else to consider is that warm vinyl tiles stick better than those that are cold. You can try using a hair dryer or heat gun to gently increase the temperature of your tiles before you apply them to the ground. They don't need to be very hot, but warmer than room temperature will help with adhesion. Along the same lines, ensuring that the room where you're installing the tiles is at an appropriate temperature before you begin installation will be helpful. The heat should be turned on and set to about 70 degrees Fahrenheit. If you've just recently applied vinyl tiles and one pops away from the floor, you can try to reactivate the adhesive by running an iron lightly over the surface. You can also try to apply a bit of additional adhesive underneath the tile and lay a stack of heavy objects, such as books, on top. Leave the weight on the tile until you can gently pick the pile up and don't see it start to peel away. Can You Glue Down Peel & Stick Tile? Can You Put Linoleum Over Tile Floors? Can You Seal Peel and Stick Tiles?